Two days to the exhibition and 11 of us met up for final planning and to run a few trains. The layout was full of trains, some on test for Saturday. Martin’s Eurostar lost a power car with a broken coupling and had to be rescued by a ’66’. This made an excellent rake in its own right – perhaps more interesting than the full Eurostar. Behind is Martin’s scratch built ‘Gatwick Express’ units. Neatly done and a colourful reminder of an interesting train. Simon was testing his mainly kit built breakdown train…. 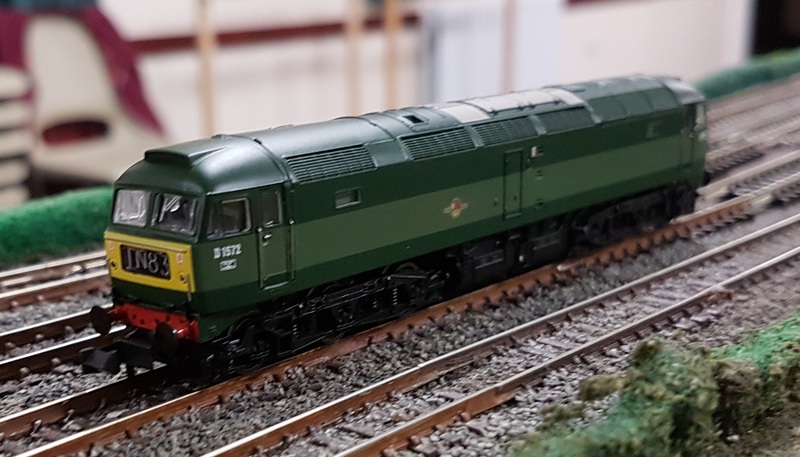 I had abandoned my ‘no more trains’ policy and bought a Bachmann Class 47 – or of this vintage a Brush Type 4 – in my favourite diesel livery. The two tone livery always looks smart, and I remember seeing diesels like this at the London termini. So, it’s back to the hall tomorrow afternoon to load up the cars and start the slow set up of the exhibition. Then we’ll see who turns up on the day. I’m not impressed that ASLEF have gone on strike again, that may stop a few people who would be coming to the show by train. Poor display of solidarity….